In 1947, my father’s story “The Mink” was bought by Cosmopolitan as a novelette and retitled “The Crystal Years.” (Dan, my father, later expanded it into a full-length novel and kept the Cosmopolitan title.) The novelette was published in the April 1948 issue. I was nine then; Penny, my sister, would turn seven in July. This sale was very exciting. Indeed, it was news, and the Laconia newspaper sent a reporter to our downstairs half of the house my folks rented on Academy Street. For a photo, Dan was posed sitting in the living room in a suit and tie, musing over his old Remington typewriter set on a coffee table—ordinarily the typewriter resided on his writing table in my folks’ bedroom—while Ernie, my mother, and Penny and I looked on admiringly, all dolled up, Ernie’s hair in an upsweep. Besides success, the sale meant money. Not enough to put a down payment on a house, but enough to buy escape from the apartment in another way. To the northwest around Lake Winnipesaukee from Laconia, in Moultonborough, out on Moultonborough Neck near the bridge to Long Island (not that Long Island! ), a realtor had bought a chunk of lakefront woods and divided it into lots. Dan and Ernie were the first customers to buy a lot. I can’t remember its dimensions, if I ever knew, but because we were the only ones in that development, it had no boundaries. We felt as if the whole woods and lake were ours. As Dan drove along, Penny and I counted off the towns, down whose Main Streets we went because there were no bypasses then: Meredith, “The Latchkey to the White Mountains”; Center Harbor with its fascinating fountain dwelt in by a naked boy clutching a goose. Then came the turnoff onto the Moultonborough Neck Road. Nowadays it’s busy with a big hardware store and other businesses, but all I remember there then was maybe a gas station on the right and, definitely, an ice-cream stand on the left where, if Ernie was feeling very indulgent as we started home, we stopped for ice-cream cones. (Once, as I’ve mentioned in “Children of the Great Depression,” for some reason we hadn’t had supper, so Dan and Ernie bought a chicken basket for us all to split, an unheard-of extravagance.) We’d turn right onto the Moultonborough Neck Road, and the trip would really seem to drag as we continued the six miles down the neck. 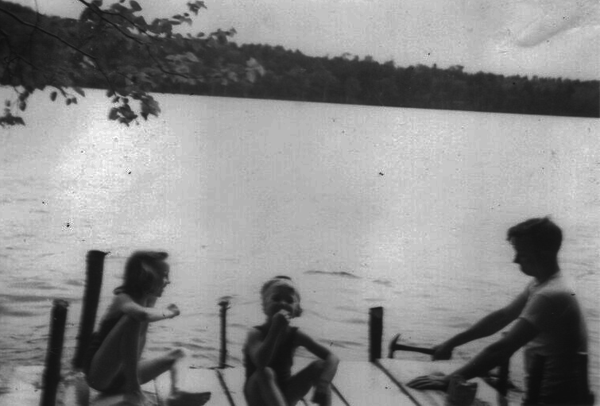 On hot summer weekdays we sometimes made the trip after Dan finished his day’s work in the time-study department of Scott & Williams, to have a swim and the picnic supper Ernie had packed—deviled-ham sandwiches, olive-butter sandwiches. But usually we went on weekends and camped out. Dan pitched a big tent that he had designed and Ernie had sewn. In it we spent the nights. Penny and I can still smell the inside of that tent, the pine boughs Dan cut for us to sleep on, the wool smell of our itchy blankets, the tent’s canvas smell mingled with the faint reek of whatever stuff Dan had used to waterproof it. Penny became the subject of a family tale about how she was so little that one night in her sleep she rolled out under the edge of the tent, where Dan discovered her the next morning, still sound asleep. Dan was the cook on these weekends, using his Coleman stove, and Penny and I remember the breakfast smell of bacon. A big project was his building a wharf. 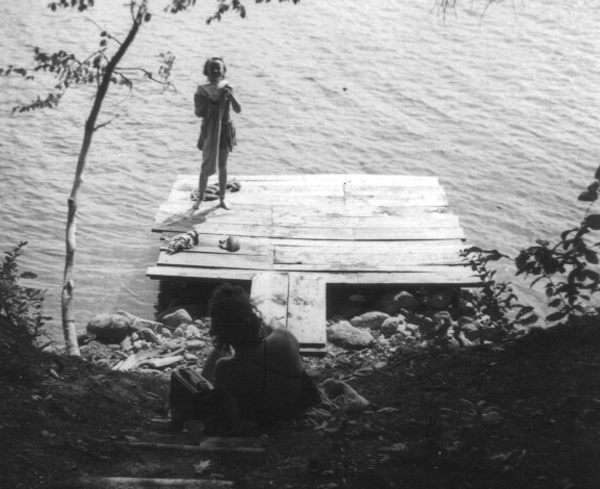 It became a sort of porch to the tent in the woods, so in addition to swimming from it we sat there, and when friends and relatives visited, it was the gathering spot. Our boat-building Uncle Lou made a rowboat for the Doan family. Uncle Lou’s talents were always doubted by Ernie, his sister, and to her satisfaction she was proved right in this instance: The rowboat leaked, though not enough to keep Penny and me from catching many sunfish from it. Dan had taught us to thread the worms on our hooks, a procedure both horrifying and mesmerizing. Penny was far more skilled at fishing than I was. I never could bring myself to detach a flopping sunfish from the hook, so Dan had to do this for me. Because sunfish were considered not worth eating, back into the lake they went. It wasn’t simply summer days. We went to the Lot in the spring as soon as the snow melted enough and as late into the fall as snow allowed. Penny remembers one winter day when she and Dan drove to the bridge, put on snowshoes, and snowshoed along the lake to the Lot, Penny worrying about the thickness of the ice. But summer days predominate in our memories. Penny and I played our various games in the woods, sometimes with friends who came with us. 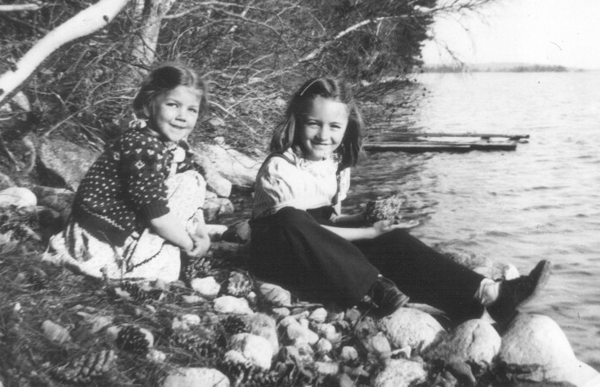 Penny remembers how she and Mary C. decided that a big rock would be a hotel and began clearing smaller stones out of the lake in front of it to make a sandy beach. They asked me what the hotel should be called, and I named it “Pine Overhead Hotel.” We also had times of solitude. Penny was in her element, exploring, learning, relishing flora and fauna. As usual my nose was in a book, but I tried to think deep thoughts about appreciating nature. One thought was that this enchanting piece of land should have a better name than what we called it, the Lot. After much pondering I came up with “Chipmunk Hollow.” But Dan, referring to our joyous yells of release when we leapt out of the car upon arrival, as well as our shrieks when we jumped off the wharf, remarked that “Whoop and Holler” would be more accurate. So I made a sign illustrated with a drawing of Penny and me with our mouths open, and Dan nailed it up on a tree. Yet of course we never did call the place anything but the Lot. And we all loved it. Then somebody from Massachusetts bought the lot beside us and began building a snazzy camp (as I’ve explained far too often elsewhere, “camp” was the term for cottages back then). We no longer had the woods and lake to ourselves. Our idyll was spoiled. And the trip was long, and the old Mercury was getting older, less trustworthy for these constant trips. Finding themselves in a situation that reminds me somehow of “The Gift of the Magi,” Dan and Ernie decided that they had to sell the Lot to buy a new car. So eventually we had a new 1951 green Ford. But we didn’t have the Lot to drive to. 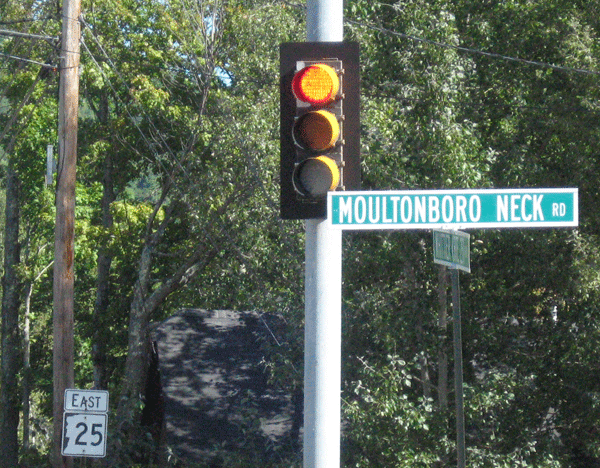 In Sandwich, I live much closer to Moultonborough Neck, and at least once a week I drive past the Moultonborough Neck Road. Back during our courtship (! ), Don and I drove down it to the bridge, which is part of Don’s memories too. When he was at Camp Belknap in Tuftonboro at age five or six, the counselors took a boatload of little boys over to Moultonborough Neck, where they fished under the bridge. (Sunfish again.) Although we’ve lived so near for thirty-five years, we’ve only gone back down the road a couple of times. The place is packed with cottages now and resembles nothing I remember from childhood. But needless to say, though say it I will, the real place exists in memories.